We are anchored at the Gold Coast, our schooner has recently sailed across the Pacific to Australia from Canada but we are not alone or even aboard on this Christmas day. We are visiting the family of a friend, Keith Watson, and watching tropical birds flutter across the table while Keith throws bits of meat in the air for the Butcher birds. He is making sure that we are welcomed here, sixty or so years after he was similarly taken into my English family back in the Second World War. Keith will not live many years after this, but right at this moment he is much the same person that war time had brought to us and made a lifelong friend. At his end of the festive table, Keith tells me a story about those years in England flying Lancaster bombers. He is describing lifting off for the first time with a full load of bombs. As he talks, his hand pulls back on the stick and his voice echoes the tension as, at last, the aircraft comes unstuck and he carefully banks into a climb to meet and then lead, with his fellow Pathfinders the stream of bombers headed across the Channel on another night raid deep into Germany. He tells us other stories over the next few weeks. We will get in the habit of taking our dinghy across the Broadwater, and visiting Keith at his retirement job with the Chamber of Commerce before buying our groceries at the shopping centre across the road. . He will brew up a pot of tea, slip next door for some sticky buns and them settle down to tell us another war story. His tone of voice tells us that these are well rehearsed and he also gives us some he has written down. His children tell us that most of his post-war life he never mentioned his wartime experiences. The national mood for many years was one of shame about the destruction of German cities, Hamburg, Berlin, Dresden...., the tremendous loss of life. Like the Vietnam War veterans, Keith’s service to his country was not well recognized. 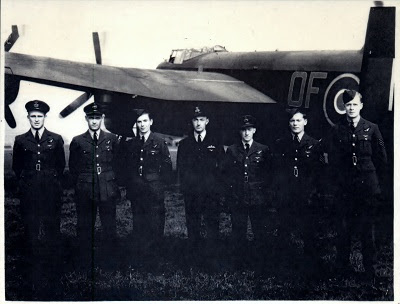 In old age, Keith has finally opened up, as much to honour all those comrades who lost their lives, fifty thousand or more, in RAF bomber command (and twice that attrition rate in the Pathfinder Squadrons), as to tell his own personal story. “Good on ya Keith” we think as we munch our buns and drink our tea. I ask him if he knew he was sometimes dropping bombs on targets located within civilian areas and he nods, yes he did, and proceeds to tell us about being in a pathfinder squadron ( 97) that lead the raids and marked the target with flares for the following aircraft. 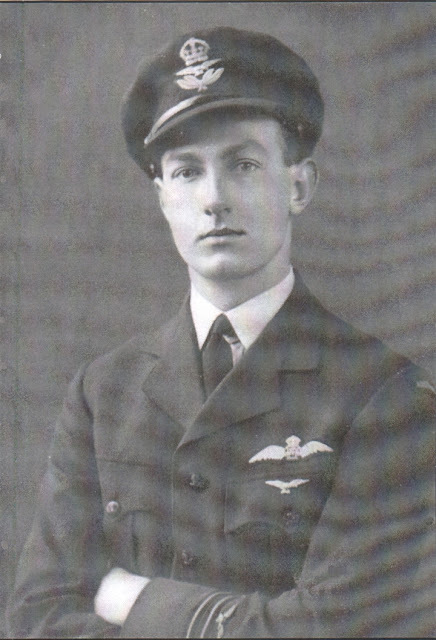 How he followed the radio voice of his leader, fellow Australian Don Bennett, circling somewhere ahead over the target, into flack so dense you could have cut it with a knife, about a shell passing right up thought the cockpit but not exploding, and of seeing a spirit of my mother as his 'guardian angel' serenely hovering there before him on the other side of of the perspex. Dodging night fighters, throwing his big four-engined aircraft through the night sky to shake off attack, coaxing his crippled Lancaster back to a landing and then doing it all over again a few nights later. Over and over again. He was probably all of twenty-two years old. A kind of steady courage that goes far deeper that the occasional heroic reaction to danger. Something that deserves recognition. My father picked up Keith and his navigator hitchhiking on the Great North Road (A1), trying to get to London for a short leave. He dropped them at our gate and later at supper time found them still there with their thumbs out, (V1 rockets were hitting London hard and the traffic was all going the other way) and said they should come in and spend the night. They stayed that first time and Keith kept coming back leave after leave. His hat would be tossed through the front door first, just to be sure it would not be tossed back again. His welcome assured, he would settle in and could often be found inventing children's adventure tales about Australia for my elder brothers and sisters. One of many young men who found a family welcome at our home during those war years, Keith was lucky to survive the terrible odds and to finally ship off home at the end of the war and to marry the girl he had met in Camp Borden in Canada while doing his flight training. Interestingly, but not out of character, the most meaningful story for Keith was when bomber crews were asked to fly to Germany immediately after the war to pick up POWs who were too ill to wait around for regular processing. For the first time his crew flew low over the land they had bombed at night from high altitude. Destruction! Landing at a bomb-cratered airport littered with wrecked aircraft, picking up a load of men and then crossing their fingers and taking off again over a dangerously bumpy runway. The emotional moments for the ex-prisoners of seeing the white cliffs of Dover ahead and then a smooth landing. A shaking of every crew members hand as those men left the plane. Thank you! The best years of his life, Keith will say, when living another day was such a gift and comradeship was so intense. Proud of his crew, of his skill that increased their odds, of his fellow bomber crews who battled their way through to eventual peace and of the many who never lived to see it. There has been much post-war discussion about the effectiveness of all this bombing: that, as in Britain, it only strengthened the will to resist. How any nation could be proud of sending men to carry out such destruction and if there were not some shame attached to those who carried out the missions. The same could of course could be said of the Luftwaffe who destroyed 80% of London and other British cities with great loss of civilian lives. The reality is that neither Germany nor Britain signed an international agreement not to use bombers as an instrument of total warfare and Keith and his fellows were doing their duty. It would be reported by the victors that that vast armada of aircraft played a vital role in winning the war sooner and with less eventual loss of life than would have been possible otherwise. Even the beaches of Normandy would not have been tenable during the landings without the bombing of beach defences and the rail-yards further back in France which prevented German reinforcements from getting to the coast. Civilians lost their lives as part of this too. War is a nasty thing; by nature destructive of people as well as property. Men and women of Keith’s generation who fought for the succeeding generations will never be fully understood or appreciated by those who were not there beside them. Mostly though, they re-entered civilian life fairly smoothly, married, held down responsible jobs, continued to serve their country in the important matters of everyday. Were loving and caring parents no matter what their wives vaguely understood through their husbands nightmares and occasional strangely absent moods. A generation who went through hell, emerged blinking into the light and then resolutely marched forward to bring their children to adulthood in peace. A peace they themselves had first to labour at great cost in lives and peace of mind to create. What a story! I can hardly understand the meaning of such experiences. We struggle with those questions: was this really necessary? No answer to find anywhere. But it is always honourable to fulfill such a hard duty. From our point of view Keith was the one person, apart from fellow ocean sailors, who really GOT what we had gone through on our voyage to Australia. He recognized the familiar signs of people who had lived with danger over a long period and who had adapted their personalities to handle it. When he shared his wartime experiences with us it was because he could see that we could relate to him as well. I wrote Keith from every port to tell him of our struggles along the way home across the Pacific and we got letters when we were back in Canada again that showed that he had worried about us all the way: he was present with us in all those moments, and for all we know was reaching out to take the wheel or pass a sail gasket when we needed help the most. A steady companion both in the tricky moments and in the calms. I’m sure that those that lived to see the end of the war carried the unseen but felt shades of their lost companions with them, shared a last drink at the pub, shared their family lives and the glorious sight of yet another sunrise. Invited the dead to live on through them. We feel much the same about Keith and in our lives we still share a spot of tea and a sticky bun with him. Here’s to ya Keith! Keith’s Canadian war bride, Norah, died last week. Her last thoughts were for her late husband, reaching for his help during the stress of her dying. She could not have had a steadier companion on her passage through life and for the journey up ahead. So glad I found your blog (again)! The postings about war time friends and relatives bring insights to me where none existed before. Mahalo plenty for the revelation that comes through in the posting. Bill, Thank you so much for your blog on Dad. You really have captured his personality, right down to the cups of tea and sticky buns, such important little rituals in the Watson household when greeting guests and visiting family. Your story about his stories, bring back the memories. After so many years of saying nothing about the war, suddenly the floodgates opened and as his death approached, he became obsessed wit telling his war stories to whoever would listen. Thank you for being a careful listener. I know that Dad valued your family so much. That value has been continued down the generations, with my sisters and daughter, Gerowyn's trips to Saltspring Island where your and Heather's hospitality was such a gift. Similarly we loved having Anne, Dale and Sarah visit us in Australia. Long may the association of Gardams and Watsons continue. I knew Keith when he was Postmaster at Southport in the 1960'/70's. when I told him I was joining thr Raaf in 1976 he told me you could do aerobatics in the Lancaster and how he had got caught in flak one night and the explosions flipped his aircraft upside down. I next saw him in the early 1990's at the Pathfunder Trophy presentation at Raaf Amberley when I was posted there. He was a very competent person with great integrity and I always remember him with fondness. I am still serving as a Reservist and only have a few years to age retirement which will give me about 42 years permanent and reserve service. Hi My father Maurice Jones was a collector and custodian of Air Force information and he met your father on one of his trips to Southport. Your father sent a Pathfinder Badge to my father on the 2nd of Sept 1999 just 3 weeks before he passed away, with a short note gifting it as no charge for you, Maurice. This badge was the last needed for his collection. When Dad died, Mum shut his shed and told us girls it will be your job to deal with it when I'm gone. Last May Mum went into care and we stepped in and divvied up what we would like and sold the rest. Last night we found a letter and the Pathfinder badge, in his special cupboard and now it is in my possesion, we remember this arriving and Dad being tickled pink to receive it. I would like to take this oppotunity to thank your Dad and family for this badge. It completed a set of badges which my son chose to keep so this one will go with them. Dads hold a special place in our hearts, don't they.